Textile making is one of the oldest technologies. The earliest evidence for loom weaving goes back to about 7000 BC, but twisting and knotting yarn into ropes and nets was practiced much earlier. Textiles are easier to transport than ceramics and glass. 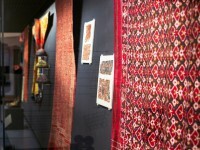 As trade items they have had a key role in the transmission of design and technique. They can be appreciated as works of art in their own right. But our understanding of textiles is enhanced if we know about their historical and social role, and when we understand something about their making. Clothing is more than protection from the elements. It is identified with gender, age, status, and cultural identity.